Unless you’ve been living under a rock or are just oblivious to who has been making noise in heavy music for last year, than you probably have some familiarity with teenage, upstart metal band from Brooklyn, NY, Unlocking the Truth. Starting as an instrumental two-piece rocking out in Times Square as street performers, the duo’s (later trio) video went viral, and the world took notice. Seemingly overnight, Unlocking The Truth became the band du jour to serve as opening acts for the biggest names in rock and metal including Guns N Roses, Queens of the Stone Age, in addition to playing mammoth festivals like Coachella and Heavy MTL. More recently, their ascent to fame has been capped off by securing a highly publicized and possibly lucrative record deal with Sony as well as a performance on The Colbert Report, which is unheard of for metal acts. The public at large appears to be fully embracing this band. Overall, I think that is a great thing. I can’t help feeling somewhat connected to the band. For a time, God Forbid was considered by some to be the torchbearer for black metal musicians. Despite our bass player, John, being white, and my brother and I being bi-racial, race was a big part of our narrative. Especially in the early years. It made me proud to be an ethnic metal band, knowing that it lifted the stigma for many young black people who were hesitant to get involved in music because of the resistance between black, urban culture and rock music. Even if it’s not true, I would love to believe that God Forbid helped pave the way for a band like Unlocking the Truth, and make their journey easier. 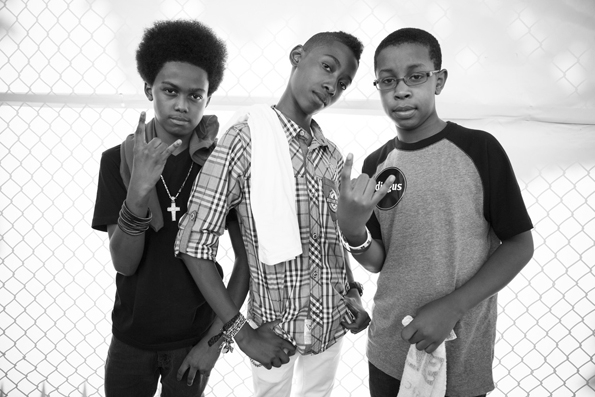 Although I feel that Unlocking the Truth’s presence is a net positive (lord knows metal needs some exciting stories), something about the meteoric nature of their transition from obscurity to notoriety is troubling. I couldn’t shake the feeling, so I kept ruminating. The pure talent and ability, for such young people, is obvious. These kids can play. They also aren’t scared of the spotlight. That shows confidence, which usually takes a lot of time to cultivate. The question has to be asked: Is this band as good as the hype machine is telling us or are we all just wrapped up in the subterfuge of a charming, appealing underdog? After a good deal of thought, my diagnosis is that the momentous adulation is slightly premature. We are crowning the king before he is ready to rule. Out of some politically correct instinct, the media has been tip-toeing in pointing out the band’s inherent novelty: They are teenagers and they black. Right now, people are enthralled with the novelty and the raw talent. But, we are yet to hear a song that exemplifies what this band has to say as musicians, artists, lyrically, and sonically. We haven’t heard that song because the band has not released any material yet. How excited can you be for a band that you don’t even really know what their music is? Maybe we’re in a time where the music is supplementary to the spectacle and the story. There are plenty of great bands out there who are personally boring as hell. No story. No image. No brand. No charisma. Style and substance have been glorious partners in rock n roll history. Expert tacticians with no personality bug me just as much as glamorous storefronts with empty shelves masquerading as bands. I am mainly troubled because I am worried about these kids. From what I hear, their parents and handlers are doing a great job taking care of them. Which is wonderful to hear after the nightmare stories circulated about child stars like Lindsay Lohan and Macaulay Culkin’s parents. I am worried because there is a strong chance that this moment in time is as good as it gets. They won’t always be teenagers. Novelties wear off. Especially if you don’t have the music to back it up. Will Guns N Roses or Colbert want them when they are 25 years old instead of 15, grinding on their 3rd record, and the shine has faded? Three examples of bands that come to mind who were previously heralded for their advanced skill level at a young age are Silver Chair, Kittie, and Trivium. In all cases, their first album was their biggest album in terms of record sales (US & UK for Trivium’s Ascendancy). Out of the three, Trivium is currently the only active band and has had a robust and consistent career. They were slightly older than Kittie and Silver Chair, and you could make a case that their music was good enough that their youth only enhanced success that would have already been there. At least Kittie and Silver Chair had a handful of definable hit songs that were played on the radio and MTV. The fan impact and connection was measurable. UTT has not even hit this benchmark. Having your highest point of success as a teenager must really do a number on your psyche. You can see why so many child stars end up with drug problems and mental and emotional issues. I am also a bit bothered by the populous being a little too enamored with their blackness and youngness. “They are so cute. They are black kids playing heavy metal.” How cute it is indeed. But therein lies the “soft bigotry of low expectations.” As if their youth and race are impediments. It feels like people rooting for someone with a disability completing a rudimentary physical task becoming somehow heroic. It’s unknowingly and passively insulting. We should like them for being good…period. Not good for being young, black men. We have to judge them against great music as a whole. This isn’t boxing. There aren’t weight classes. With all of that said, I am rooting for these teenagers. For all of our sakes, I hope that signing Unlocking the Truth is analogous to drafting Lebron James out of high school, and they will become the Hall of Famers so many are predicting. As a realist, I refuse to see the Emperor’s clothes. That dude is currently naked. When these young men arrive, I will be the first to greet them with open arms. We need the next headliners and gateway bands. Until that happens, let’s be supportive but reserved until there is tangible substance.